Iran Human Rights, May 28: A juvenile offender sentenced to death for a murder he allegedly committed when he was 17 years old is scheduled to be hanged on Wednesday June 11 in Tehran, reported the Iranian daily newspaper Etemaad. He is identified as Mohammad Fadaei (21) and is convicted of murdering Saeed (21) under a fight in a billiard club in 2004. At that time Mohammad was 17 years old making him a minor. Mohammad was sentenced to death and his execution was scheduled to take place on April 16. But his execution was postponed because his defence lawyers were proved to be fake! However, the supreme court didn’t accept to reconsider the case and his family are now told that Mohammad is going to be hanged on Wednesday June 11. According to Mohammad’s father, the murder was accidental and Mohammad acted in self defence. Several minors are scheduled to be executed in the near future. Besides Mohammad, at least three other minors: Behnam Zare, Behnood Shojaee and Saeed Jazee are few steps away from execution. Iran has ratified the UN’s convention of children’s right which banns death penalty for the offences committed at under 18 years of age. However, more 90 juvenile offenders are on the death row in the Iranian prisons. At least 11 minor offenders were executed in Iran in 2007, and so far this year at least one minor has been hanged. According to many human rights activists,intrnational pressure could be the only way to save these minors life. Iran Human Rights, May 28: One man was hanged in the prison of Bojnord, in the Northern Khorasan province, today reported the state run Fars news agency. He, who was not identified by name, was convicted of drug trafficking accprding to the report. 8 people were hanged in this town during the last Persian year said the report. Iran Human Rights, May 25: One man was hanged in Ardebil, north-western part of Iran, reported the state run Fars news agency today. The man, who wasn’t identified by name, was convicted of murdering his wife in 2005 according to the report. According to the report, he was hanged by the parents of the murdered wife, in the prison of Ardebil. Amnesty International today challenged world leaders to apologize for six decades of human rights failure and re-commit themselves to deliver concrete improvements.“The human rights flashpoints in Darfur, Zimbabwe, Gaza, Iraq and Myanmar demand immediate action,” said Irene Khan, Secretary General of Amnesty International, launching AI Report 2008: State of the World’s Human Rights.“Injustice, inequality and impunity are the hallmarks of our world today. Governments must act now to close the yawning gap between promise and performance.”Amnesty International’s Report 2008, shows that sixty years after the Universal Declaration of Human Rights was adopted by the United Nations, people are still tortured or ill-treated in at least 81 countries, face unfair trials in at least 54 countries and are not allowed to speak freely in at least 77 countries.“2007 was characterised by the impotence of Western governments and the ambivalence or reluctance of emerging powers to tackle some of the world’s worst human rights crises, ranging from entrenched conflicts to growing inequalities which are leaving millions of people behind,” said Ms Khan. Amnesty International cautioned that the biggest threat to the future of human rights is the absence of a shared vision and collective leadership. “2008 presents an unprecedented opportunity for new leaders coming to power and countries emerging on the world stage to set a new direction and reject the myopic policies and practices that in recent years have made the world a more dangerous and divided place,” said Ms Khan. Amnesty International challenged governments to set a new paradigm for collective leadership based on the principles of the Universal Declaration of Human Rights. “The most powerful must lead by example,” said Ms Khan. The EU must investigate the complicity of its member states in “renditions” of terrorist suspects and set the same bar on human rights for its own members as it does for other countries. Ms Khan warned: “World leaders are in a state of denial but their failure to act has a high cost. As Iraq and Afghanistan show, human rights problems are not isolated tragedies, but are like viruses that can infect and spread rapidly, endangering all of us.”“Governments today must show the same degree of vision, courage and commitment that led the United Nations to adopt the Universal Declaration of Human Rights sixty years ago.”“There is a growing demand from people for justice, freedom and equality.” Some of the most striking images of 2007 were of monks in Myanmar, lawyers in Pakistan, and women activists in Iran. “Restless and angry, people will not be silenced, and leaders ignore them at their own peril,” said Ms Khan. Against any imperialist intervention. The immediate and unconditional end to sanctions on Iran. Against the theocratic regime! For solidarity with the working class, women’s and students’ movements against the theocratic regime. “This is important step forward for Hopi could not be more timely, coming as it does when leaked news over the weekend suggests that Bush has been secretly briefing key US senators on plans to launch airstrikes against Iran with the next two months. When a major union of the size and reputation of PCS takes such an explicity stand against imperialist sabre-rattling, a powerful message is sent out to the war-mongerers”. The motion supporting Hopi was opposed by just 50 or so of the 1,200 delegates, although it was opposed by leading PCS member, Jon Gamble. Writing in the Morning Star (May 27), he denounced the “con trick” played on the conference and charged that by “raising the issue of the nature of the islamic regime in Iran” Hopi thus “seeks to split this movement on sectarian lines” and “provides a left cover for liberal apologists for war”. In a statement released on its website (reproduced below), Hopi firmly rejected these charges as “lies and slander” and offered to debate opponents such as John Gamble to clarify its real politics. An Iranian woman weaving rug . I have to note that I personally regard sectarian propaganda against the Bahai’s to be ‎against national and public interest of Iran and object the Iranian government for exerting ‎pressure on the Bahai’s to suppress them. In the end, however, I suggest to the Bahai’s to ‎reconsider their decision to promote their religion inside Iran, because of the hefty ‎consequences that they may have to pay. Mr. Mohammad Mostafaei , the lawyer of 20 teenagers who are sentenced to " Ghesas" (death). Help stop the death sentence of 100 teenagers in Iran prisons ! Based on a news from Iran , Mr. Mostafaei has written a letter to the head of the judiciary power and requested from him to help stop the death sentence of 100 teenagers who are currently serving their sentences in Iranian prisons. In the letter he asked from the head of the judiciary power to follow the law and stop the death sentence of childeren under 18 years of age.
" As you know , at present there are around 100 person detained in prisons in the country, who's age at the time of criminal act was under 18 years of age and with the issue of "Ghesas" and death sentence , they live their day and night in a worse condition and are awaiting for a death sentence which befall on them in an unfair way." On 1993 Iran has signed the convention on childerens rights and on 1975 has joined to the International charter on civil and political rights . "Mr. Shahrudi , i wish that you could make effort to see and meet these childeren , so that you could come to the conclusion that they are in fact the victims of the society." "Mr.Shahrudi , you have approved the death sentence of three teenagers namely : Behnam Zare, Behnud Shojaei and Said Jazi who are my clients and who were arrested when were under 18 years of age. " Ahmad Batebi has escaped from Iran! According to a news Ahmad Batebi one of the Iranian student who actively participated in the student uprising on the early reform government and who was sentenced to 15 years imprisonment and was serving his sentence had escaped from Iran. The news indicated that he was on a temporary release from prison for vacation on last april, when he decided to escape and rather not to return to prison. The ministry of information has reacted widely to arrest him. The Islamic Republic is not for free flow of information but for free flow of illiteracy and not only in Iran but in the world as well! The Islamic Republic is not for the progress and developement of Iran and Iranian. 12 women website has been filtered! Widespread filtering of the websites: The "Campaign for one million signature"
In total 12 of these campaign websites has been filtered by the Ahmadinejads government . the active websites from Mashhad, Arak, Shiraz, Zahedan, Rasht, germany, California, Cyprus , Kuwait were among those filtered by the recent crack down . At present out of 19 campaign websites 15 websites has been filtered . The website of "Men for equality" was also filtered. In the past the websites like : " Picture for equality " and the website from Azarbayjan and Kurdistan was also filtered . -The website known as " Meydane Zanan " ( the circle of women) for the second time has been filtered . -The website of the" Association of Iranian Women " for the third time was filtered. Global Peace Index RankingsThe table below provides the GPI rankings for the 140 countries analysed in 2008 and the 121 countries analysed in 2007, as well as year-on-year comparison. Countries most at peace are ranked first. A lower score indicates a more peaceful country. You can click on a country to see the detail of its peace indicators and drivers. Iran rank 105th among the most and least peaceful countries.
" let me free" , in a second people (pedestrians) gather and shout at the agents and let the women free. 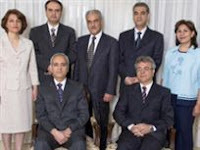 Six national leaders of the Bahai society in Iran has been arrested! Ms. Fariba Kamalabadi, Mr. Jamaludin Khanjani, Mr. Afif Naimi, Mr. Said Rezaei, Mr. Behrouz Tavakoli and Mr. Vahid Tizfahm . Ms. Mahvash Sabet is also one of the leader who was arrested on March in the city of Mashhad and is still in prison. On Wednesday their home was invaded by security agents . Their personal belonging were searched and then were arrested in their home. Based on a report by a Bahai news website "From the begining of revolution upto now at least 200 Bahai's are executed in Iran". In another report by Bahai International society in the last two years around 128 Bahai students were expelled from Iranian Universities. Play the video clip and listen to a new born voice. A 20 year old homosexual need human rights organizations support. For defending himself from two individuals , he has caused severe injury to one by knife. As a result the victim lost an eye. The accused homosexual "Mehdi" was sentenced to 10 months prison term and to pay "an eye money " to the victims parents. Mehdi has already finished the 10 months prison term but do not have enough money to pay the victims family and because of this he is still in prison and under severe psychological pressure. Help save the lives of these three individuals ! 1st - Ali Mihan Torabi , an honor student in the city of "Gohar Dasht-Karaj" . He is accused of killing a young man ( Mazdak) in a quarrel when he was only 15 years old. His principal at school believe that at the time of quarrel many people gathered at the scene and because of the squeez by the people both young men were thrown to the ground and this is when a knife which was in the hand of Ali accidentaly entered in Mazdak's body and he died later . 2nd- Behnoud Shojaei is the other teenager going to the gallows. He is accused of killing another young man in a group quarrel when he was only 17. Read more about this story in previous Iran Watch Canada posting. 3rd- Somayeh is a 24 years old woman who is accused of killing her boyfried who after long relation didn't want to marry her. The danger for military strike has been increased! Ebadi is one of the most critic on the situation of human rights in Iran . In an interview with Roozonline , she said she is worried and warned that the military threat by America against Iran has been increased. Emad Baghi has been transfered to the medical clinic in Evin prison! While in prison he has been again summoned to the court . Baghi has been in prison since October 2007.His writing inside the prison and his books has also been searched by the prison agents. Fars New Agency choose this picture taken by Ms. Parvin Imani as their best picture. The picture was taken in an area between " Tarem- Fuman" in the north of Iran. Taking the life of a human in any ways : Gallows, stonning , injection ,fire squad ... are barbaric ! Do you remember this . It was posted in previous Iran Watch Canada . The life of Akram priced for 60,000,000 Million Tuman ( $60,000) . She goes to gallows if the money isn't ready. Ms. Nazanin Bonyadi an Iranian actress of the film " Iron Man" put her Emmy Awards dress on auction to save the life of Ms. Akram Mahdavi a 30 years old women in Iran from death. The blood money needed is about $60,000 . Efat Mahbaz wrote an article about Akram's need for our support to save her life. 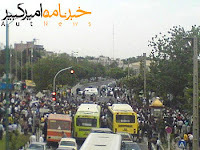 Technical university students in all over Tehran continued their protest ! Widespread protest of the students from "Shariati, Valiasr and Shamsipoor" colleges which was started from last Monday , on its 3rd day was joined by the Enghelab College. The protest development to nearby streets where the colleges are located brought the reaction of many police forces. Yesterday these forces used baton to disperse the students. At eight in the morning these college students marched toward the "headquarter of the inspection organization" and gathered there and demanded the officials to reveal new government projects for these colleges. The students are protesting to the policies and projects which the Ministry of Science is going to take to change the system of these colleges. More than 3000 workers of the "Nishekar- Haft- Tapeh" company since Monday went on strike. The new round of the strike is because of the delay in their last two months salaries. 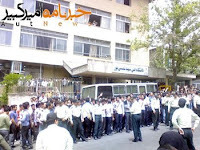 the workers also demanded the Government of Ahmadinejad to end the "policy of summoning and case making " against the labor activists and demanded Mr. Yaghub Shafiei the president of the company , the board of directors and the head of Herasat who spy on workers be removed from their position . In the previous strike by the same workers , 5000 workers despite of the danger of prison and losing the job and income bravely went on strike and as a result; several of them ( Mr. Fereidoon Nikofar, Mr. Jalil Ahmadi, Mr. Ali Nejati, Mr. Mohammad Heidari Mehr and Mr. Ghorbanali Ramezanpoor) including a journalist Mr. Abolfazl Abedini who reported about the strike was arrested and detained but were released later on bail . Iran must stop sending teenagers to gallows! One month time has been given to Behnoud Shojaei to ask from the victims family to pardone him from death! Mr. Shahroudi the head of the Islamic republic judiciary system gave one month to Behnoud to ask the victims family to pardon him . So, this way the Islamic Republic judiciary is trying to pardon itself from any envolvement in his death which is going to take place in a month. In fact it is the Islamic Republic judiciary system which must be aimed and blamed for this young man's death, if he goes on gallows . Behnoud Shojaei was a teenager when he commited the crime in a street fight.Two days ago he wrote a letter to the mother of Ehsan ( Omid- the victim ) and asked her to forgive him. The letter was published in Etemad newspaper. Please call and Fax through these numbers, and ask to stop sending this teenager to gallows . All Iranian in support of their Kurdish colleagues! 250 civil rights ,political and students activists in a petition protested to the death sentence issued by the Islamic Republic judiciary for three Kurdish human rights advocates! Recently division number 30 of the "Tehran court of revolution" in a closed door and 10 minuites deliberation sentenced three young Kurdish human rights advocates : Mr. Farzad Kamangar , Mr. Farhad Vakili and Mr. Ali Heydarian to death . They have been allegedly charged with " action against national security". These three young Kurds have been arrested 17 months ago and the security agents put them under intense interrogation in Sanandaj, Kermanshah and Evin prison. Mr. Farzad Kamangar was an activist in the field of human rights and was volunteering with the " Organization of the Human Rights Defenders in Kurdistan". He has been tortured while in prison and under interrogation by electric shock and also his body shows sign of burn . Farzad spent 9 months in solitary confinement and during this time had no contact with his family members and more worse he was kept in the worse Iranian prison known as " Rejaei Shahr " prison in the city of Karaj. In another news the court of revolution in the city of Mahabad has sentenced Mr. Khaled Shirzad another young Kurd from the city of Bukan to five months jail term. This sentence was approved by the court of review . Worlds two great mind ! Freedom of the information has become impossible ! Report on the media suppression in 2007! 23 day after the arrest and no news about Masud Rafiei Taleghani the journalist of "Farhang Ashti "and "Etemad" newspapers and a blogger , the Association of Iranian Journalist on the coming of May the 3rd the World Press Freedom Day has published a report and announced that ; 29 publication were closed , 15 journalists were arrested, 17 journalists were summoned or interrogated and 39 sentences were issued against Iranian journalists. Masud Rafiei Taleghani was arrested by the security forces but until now no judiciary official has taken the responsibility about this arrest and no report was published about his where about and his charges. Last Friday and after close to three weeks Mr. Esmail Jafari a photojournalist for “Bushehr” local weeklies who was arrested since April 7 while taking picture from a strike by the workers of “Sadra” company was released . One day before him , Masud Rafiei Taleghani journalist of the “Farhang Ashti” and “ Etemad “ newspaper was arrested by the plain cloths security agents, news which was announced with two weeks delay by the Association of Iranian Journalist. It was reported that after the arrest the agents searched his home and confiscated some of his writing and documents. The Association of Iranian Journalist believe that; the situation for the journalists and media compare to previous year based on judiciary issues have become worse and media and journalist paid heavy price . The government organization like the Press jury has increased their pressure and restriction on journalists and media including the web writers and online news agencies. The restriction also included continuous filtering and closure of some of the news agencies , websites , and online news agencies such as ILNA , Baztab, Nosazi and the website which were reporting and analyzing the situation of women. According to the Association of Iranian journalists during the last year up to the month of May 2008 , 29 publication which some of them like “Mahnameh Zanan” ( Women Monthly ) and bimonthly of “ Donyaye Tasvir “ which was publishing for 16to 17 years and some like “Arya” newspaper was closed before publishing. “Sharq” and “Hammihan” were the most popular newspaper that were closed during the last year. “39 cases of criminal charges and conviction of journalists to prison, cash penalty, lashes, ban on departure from the country, exile, bail payment and preparing surety were another part of the widespread systemic oppression of media during the last year. 15 journalists from May last year up to now were arrested and 10 journalists are currently in the prison and according to the Association of Iranian journalists 17 journalists have been summoned to the public prosecutors office. And in addition more than 120 trial session have been taken for the managing editors and journalists . This situation has endangered the “job security and professional independency “ of the Iranian journalists. According to a report by the Association of Iranian journalists “ the growth of the criticizing media has reached to zero and in the year 2007 only two publications was given to special interest people who agreed with the existing situation “ . In addition red lines have been increased during the last year which increasingly tightened the flow of free information and news in the country”. Teen will be put to death on May 7 , need our support! Amnesty International asked everyone to write to Iranian officials to stop the death sentence of this teenager . Behnoud Shojaei was 17 years old when he commit the crime . He is going to be put to death at 5:00am on May 7. At least 86 criminal teenagers and 15 Afghan teenager living in Iran are awaiting the death sentence to be carried out against them.